Process wastewater treatment, recycling, solutions for saving energy or for materials recovery are now indispensable in the industry. Industry needs water for various purposes. On the one hand it can be processed so that it complies with the required quality, on the other hand, the process water must be treated to be either introduced properly, disposed of or recycled back into the process cycle. Therefore, often combinations of processes are necessary in order to achieve optimum results in water / wastewater treatment. 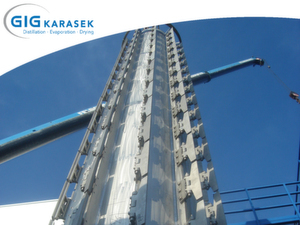 GIG Karasek uses thermal processes, whereby the thin film dryer is the key component of the process. The thin film dryer consists of a vessel with nozzles for product, vapors, heating medium and a special rotor system. The product is distributed continuously over the entire jacketed wall, constantly mixed and at the same time transported by special rotor elements.. The blades do not touch the inner surface of the vessel. Powerful built wiper elements, arranged with a fixed clearance, prevent crusting or clogging of the heating surface, which can arise during evaporation of liquids from solids. Using GIG Karasek Dryers it is possible to dry liquid product to powder. Horizontal thin film dryers are suitable for effective drying of sludge, pastes and moist solids and the concentration and thickening of sewage. Due to the low product holdup and the excellent product turnover combined with increased residence time, best drying results are achieved. This machine is characterized by low energy consumption, self-cleaning heating surfaces and easy accessibility. Depending on the product and requirements a residual moisture content of a few percent until completely dry is reachable. The product residence time with greater driers is between about 1 - 10 min, depending on the drying object and the rotor assembly. The dryer can also be turned off at any time with product content and started up again after a while without cleaning or maintenance activities needed. The longer dwell time and the small amount of sludge in the dryer also have more technical advantages. It is possible to adjust the dry matter content of the sludge on the heating temperature or the amount of feed in the dryer at any time and to change at short term, and so adjust to the requirements of a fluidized bed combustion. 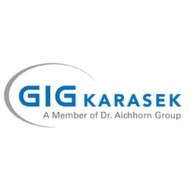 GIG Karasek has a variety of completed projects. Installations for waste water treatment for the evaporation of process water with high salt content or the working up of chemically contaminated sludge by paddle dryer are just two examples of the extensive wealth of experience. We will inform you in detail at IFAT 2016 in Munich from May 30 to June 3.